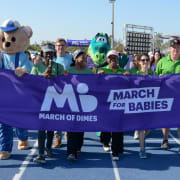 March for Babies is the March of Dimes signature campaign and event that invites corporate and community partners to participate as sponsors and teams to further the March of Dimes mission. Annually, March for Babies in Miami-Dade hosts over 5,000 walkers. March for Babies is an exciting, compelling and rewarding event. Participants have fun while supporting life-saving and life-changing research, education and community programs. We are proud to have corporate sponsors and support from companies, such as Publix, HCA Healthcare, SunTrust, Wells Fargo, and Kmart. The mission of the March of Dimes is to improve the health of babies by preventing birth defects, premature birth and infant mortality. Prematurity is the #1 killer of babies in the United States. We are working to change that and help more moms have full-term pregnancies and healthy babies. From polio to prematurity the March of Dimes has focused on researching the problems that threaten our children and finding ways to prevent them. Volunteers can assist in preventing this worldwide health crisis by supporting March for Babies. All babies, whether they're born early or right on time, benefit from advances in prenatal and postpartum care made possible by the March of Dimes. We are so proud to say that we're all March of Dimes babies - you, me, our children and future generations of kids.